November 4, 2015 By This post may contain affiliate links. Our Halloween party guests watched in awe as the bride and groom cut into a 4 layer Halloween Wedding Cake to reveal the surprise hiding inside! 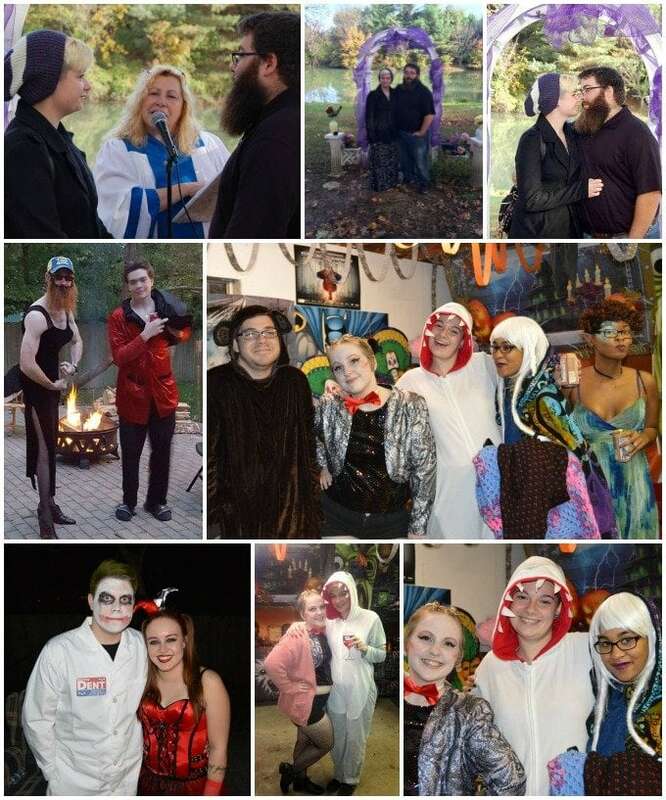 This Halloween, our party was extra special, as we celebrated the marriage of two friends. 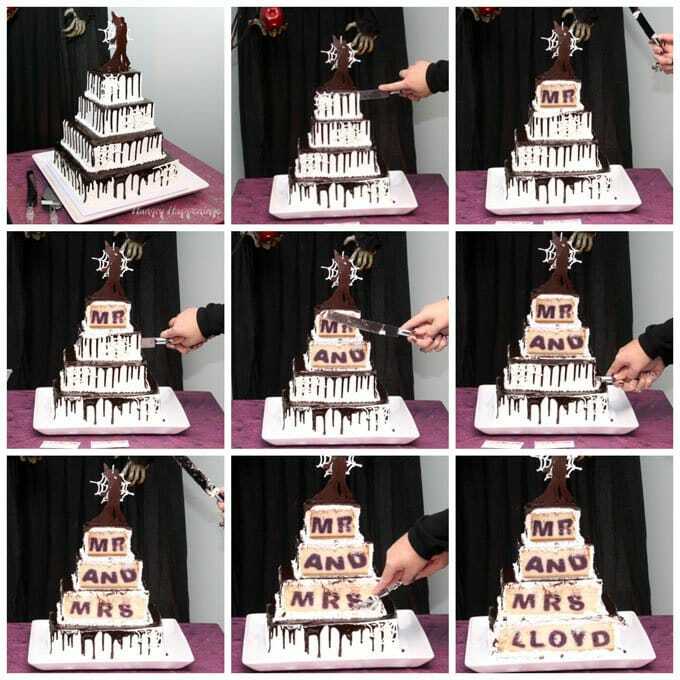 At the request of the bride, I created a wedding cake that when cut revealed the happy couple’s new name, Mr. and Mrs. Lloyd. I think I was just as excited as the bride and groom to see the big reveal. I’ve made several cakes with surprises hiding inside, but nothing this elaborate. As a matter of fact, this was only the second wedding cake I’ve ever created. I was a nervous wreck making, decorating, delivering, and stacking this cake. Then the knife came out and the bride and groom began to cut. The butterflies in my stomach started fluttering like crazy. When the final slice was cut, I would have done a back flip, if I were able. The surprise hiding inside this cake looked just as I had hoped. It was perfect. The cake was fairly large, but our guest list was even larger, so we made lots of other Halloween desserts. 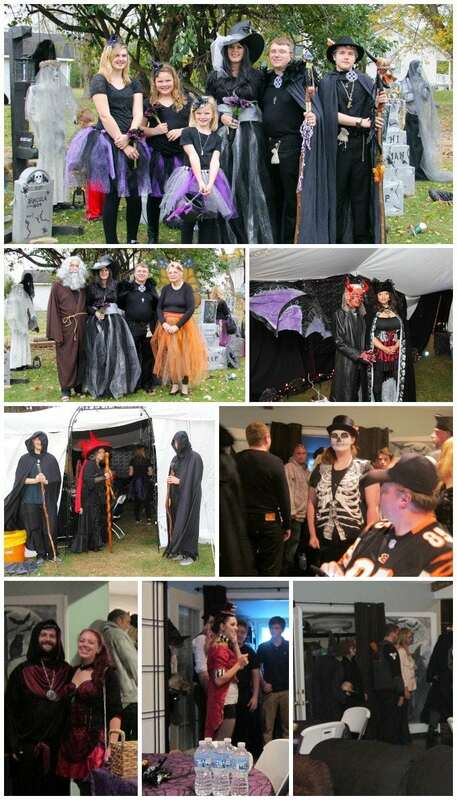 For the first time, in the ten years that we have hosted a Halloween party, the event was not held at our house. We combined efforts with friends who decked out the interior and exterior of their house for the big day. They even built a haunted house. It was spectacular. 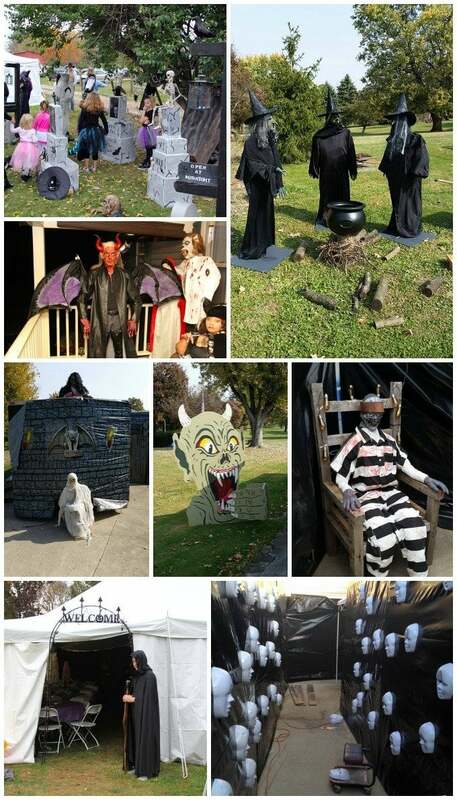 I have to admit that it was very strange not having our own house decorated for Halloween, but I really enjoyed having my friends do the decorating for a change, especially because this was not the only Halloween wedding, I was a part of this year. NOTE: I can’t take credit for many of the images above. Most were taken by Jeff Day who was kind enough to share them with me because I was so crazy busy during the party that I only snapped a few pictures. Thanks, Jeff! A few days after our big party, I traveled to Virginia to celebrate my niece’s Halloween wedding. It was a casual outdoor affair and I was in charge of making all the desserts. My niece requested cupcakes and creme bruleé be served alongside other festive Halloween treats. I made bleeding heart creme bruleé, eyeball cheesecakes, cupcake monsters, cake pop skulls, white chocolate popcorn, and more. You can see why my blog posts have been a little more sparse than usual this Halloween. This October was even busier than the October fifteen years ago when I celebrated my own wedding. I didn’t even have time to take pictures so I could create a tutorial for this surprise wedding cake. Just getting the cake made was challenging enough. My website crashed due to high traffic volume the day before the wedding, and the cake wasn’t even frosted or decorated, leaving me less time to get it done. Fortunately the bride wanted chocolate ganache dripping down a white cake. It was a super simple wedding cake design. To dress it up a bit I added a few white chocolate spider webs and a chocolate silhouette cake topper of a bride and groom kissing. To go with our witch party theme, the bride was wearing a witch hat. Cutting into the cake to reveal the surprise hiding inside will be a wedding moment you will remember for a lifetime. Wow, Beth your cake turned out amazing and perfect! 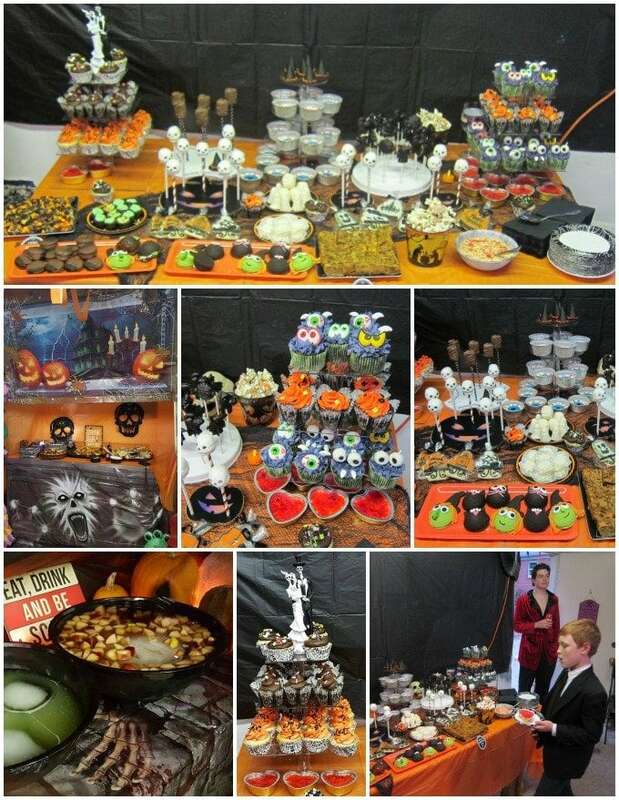 I’m sure the guests were stunned to see the reveal inside, not to mention all the other over the top desserts and decorations – truly a special event for all who were able to attend! Thanks, Kim. That cake was truly a labor of love and I was so happy the bride and groom loved it! Incredible job! So many amazing and creative ideas! You are so so so talented! Thanks, Sharaden. 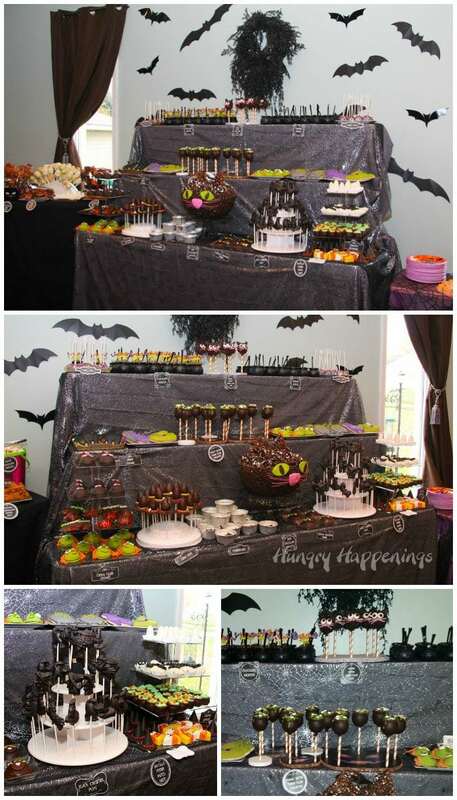 I always love creating for our parties. 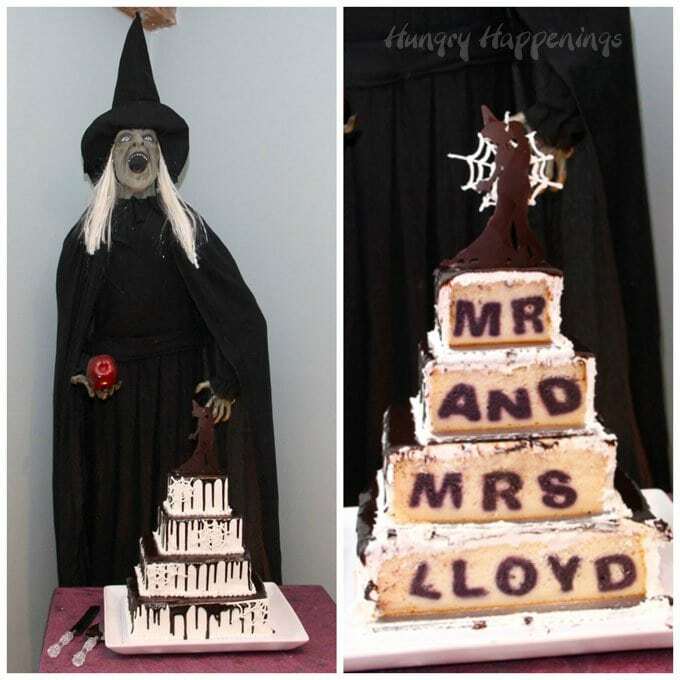 What an amazing cake for the lucky couple! After all the baking and decorating you accomplished, I hope your costume was Wonder Woman! LOL! That’s so sweet of you to say, but the thought of it made me laugh out loud. With all the baking and decorating I do, I could never pull off dressing as the actual Wonder Woman. Oh, if only!